JNN 26 Dec 2014 Jerusalam – Zionist regime authorities in the city of Beersheba, in a symbolic gesture, have recently converted an historic mosque into a museum, despite the fact that 10,000 local Muslims still have no place to pray. Locals told Ma’an News Agency that an exhibit was recently opened in the building that was formerly the Great Mosque of Beersheba, once used regularly as a mosque before the 1948 expulsion of 750,000 Palestinians from the area. The exhibit, locals say, has no Arab or Muslim member on the technical supervisory team, and is scheduled to continue until June 2015. The mosque was built in 1906, during the Ottoman era. The mosque remained active until the Zionists occupied the city in 1948, turning it into a detention center and headquarters for a magistrate court, following the expulsion of approximately 6,000 Beersheba residents, mostly to Gaza. Thousands of Jewish immigrants were subsequently brought in to populate the city, while Palestinian refugees — who now make up the largest refugee population on Earth — were never allowed to return, despite the fact that most of them lived only kilometers away. 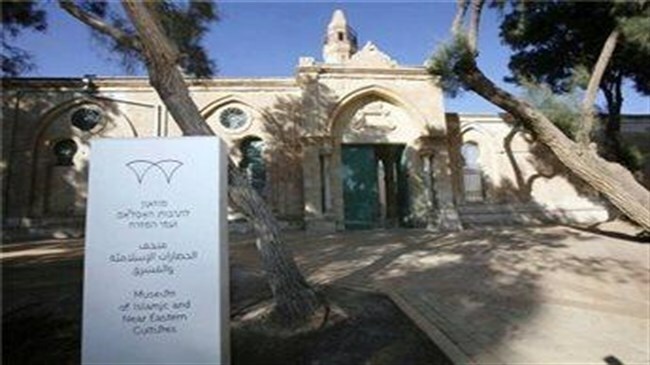 This entry was posted in Middle East and tagged Beersheba, israel, Mosque, Museum, Zionist. Bookmark the permalink.